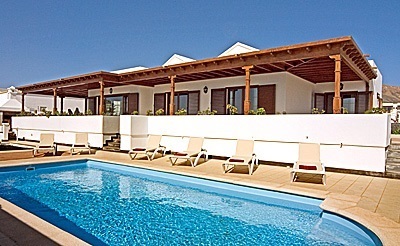 Villa Esperanza is a three bedroom villa situated in the Puerto Calero resort in Lanzarote. It is only 5 minutes walk to the marina, where you can book marine excursions. There is a large electrically heated pool which is surrounded by a south facing terrace and sub-tropical gardens and spacious grounds. Highlights of this villa include an internet connection and beach towels are also provided. There are 2 bathrooms, one of which is an ensuite to the master bedroom. The villa sleeps up to 6 adults on beds and 1 child aged up to 12 years can be accommodated on a foldaway bed. Inside the villa includes a large lounge and dining area with satellite TV and a well equipped kitchen.